What a coincidence! In all my life of following the Indian Cricket team we have never won in England and now that I'm in England, they go ahead and beat the British at their own game! I would never forget the two tests I watched here at the Lord's and the Oval. And years from now, when people talk of the last time Dravid, Sourav, Kumble and Sachin played in England and won a test series, I can claim 'I was there'. It was very heartening to see the Indians play like they did. They were ready for the long grind, and what's more, seemed to enjoy it too. The two big totals posted in Trent Bridge and the Oval were built upon a string of partnerships rather than the old habit of two batsmen putting on 300+ and the others managing 200. The bowlers were able to bowl England out in 5 innings out of 6, which is quite simply the main reason we won the test series. Pakistan, for instance, have a much better 'away' record than India since they have always had bowlers who could take the 20 wickets. 1. We had the opposition captain and their best batsman getting sublime hundreds and losing the series. 2. Rahul won two crucial tosses. 3. Our batsmen received bad decisions but it did not result in the team collapsing in a heap. 4. The rain came down when we were 9 down! It was as good as it gets - and please don't tell me it could have been 2-0. Indeed, given the way the team was written off before the series, it is quite surprising that we are arguing now as to why we did not win it 2-0! A win is a win guys, take it as long as you get it! Perhaps when we win overseas as often as, say, Australia, the skipper would have the confidence to go all out for a win. As far as I'm concerned, he wanted to seal the series victory and if we had won the last test, all the better. 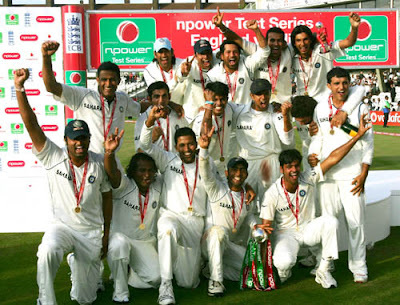 It couldn't happen due to various reasons, too bad, but hey, we have won a series in England after 21 years, surely that calls for a celebration! I dread the day Sachin, Sourav, Kumble and Dravid would not be a part of the team. What joy would Cricket then be, I wonder! But sure enough, there would be new talent to look for. The new generation could not hope to get better role models. As these players head to the final phase of their careers, though, it would be vital how much the Karthiks and Dhonis learn from them. By the looks of it, they are on the right path but that is what we had thought of Sehwag, Bhajji and Kaif a few years back. Of course, these players can come back any day but the sheer consistency which these players showed over the years would be quite impossible to replace. For me though, the one image that would linger on from this series would be that of Sachin Tendulkar celebrating with the trophy. While I spotted misty eyes there (could well have been mine), here was a man who had given it all for the game he loves so dearly and for the nation and the team he plays for. Sachin and Lara must be the most unfortunate players in that they never won anything big. Sachin is at least enjoying some test wins abroad for the past 5,6 years. Win it for Sachin boys, beat the Pakis and the Aussies! Do it for India! It was all BS what the media said about Dravid not trying for a 2-0 victory. I guess they really forgot that India had WON!